Every year, every conference, it’s the same-old, same-old. The Legal Genealogist feels your pain, especially in early June each year when there are so many genealogical education events we all want to attend. So here’s an option for folks like me who can’t be at the Southern California Genealogical Society’s Jamboree and DNA Day this year. There’s a livestream of many of the sessions. On Thursday, June 2, 2016, six sessions focusing on DNA testing will be live-streamed. Each of them is $20, or you can get the whole package for $99. Information and registration be found on the Registration & Viewing Portal page for 2016 Genetic Genealogy: The Future of the Past. • 3:30-4:30 p.m. PDT: Diahan Southard presenting Circles or Triangles? What Shape Is Your DNA? That’s great. And it’s not even half of what’s going to be available. And — even better — the rest of the livestreaming is free. Thanks to the sponsorship of Ancestry, you can watch as many as 14 sessions on Friday, June 3 through Sunday June 5, absolutely free. You just have to register in advance at the 2016 Jamboree Live Stream Registration Page. Even the breaks and lunchtimes will be filled, with videos from Ancestry’s training team — all free. Now remember, you have to register and pay for the livestreamed presentations from the Thursday, June 2, 2016 Genetic Genealogy: The Future of the Past. 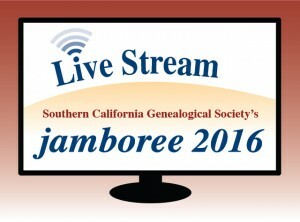 And you still have to register in advance for the free livestream for the Friday-Sunday, June 3-5, 2016 SCGS Jamboree. Not a bad way to spend some time in early June. Being there when you can’t be there.